A few days ago, I was reading the Bible during my quiet time and a verse jumped out at me. It's found in 3 John 1:14. Here is what it says. "I hope to see you soon and we will talk face to face. Peace to you. The friends here send their greetings. Greet the friends there by name." In this verse are 5 things you can do each week to impact kids for Christ. #1 - Be the person kids look forward to seeing. Do kids anticipate coming because they know Mr. _________ or Miss ____________ is going to be there looking for them? Be the kind of leader that develops a friendship and relationship with kids that has them looking forward to seeing you at church. #2 - Talk with kids face to face. Look kids in the eyes and let them know you are so glad they came. If you serve in preschool - get down on their eye level so you can see them face-to-face. Kids are longing for someone at church to look them in the eye and let them know they are valuable, accepted and loved. Make sure every child has someone who looks into their face instead of past them. And make sure it's a look of kindness rather than a stern look. #3 - Help make your church a peaceful place for kids. Today's kids are growing up in a scary world. They've heard about people being shot at school, the movie theater, a restaurant, a sports event and yes...even at church. Put the proper security in place and have plans in place that make your church a safe place where parents and kids feel protected and secure. Each week you have kids come that are facing things that are the opposite of peace. It may be their parents are getting divorced. Perhaps they feel the tension of their parents struggling to pay the bills. Perhaps they are bullied at school. Church should be a peaceful environment where kids can feel peaceful and secure. 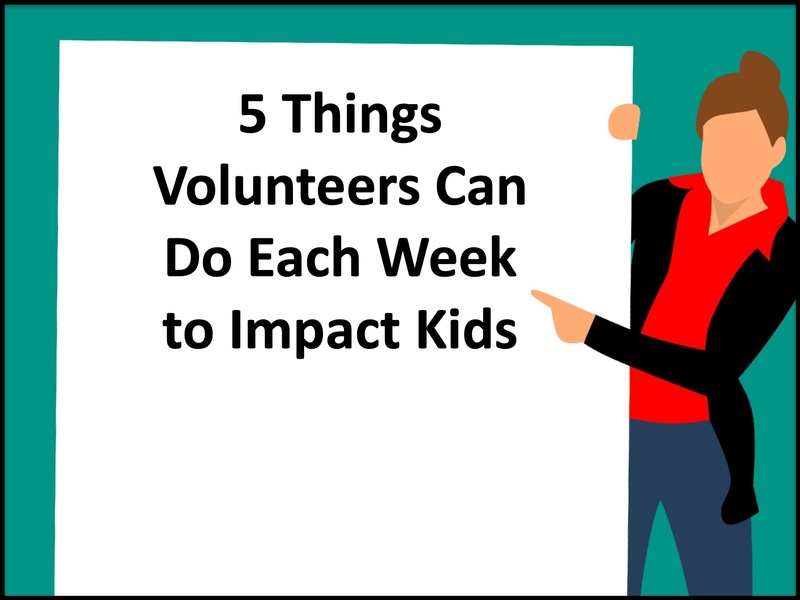 #4 - Help connect kids with each other and make FRIENDS. Kids don't come back to church because of cool videos or crazy skits or fun games. They come back because they have friends there. This is especially true with kids who are new. Make sure you help kids get connected and be intentional about helping them make some new friends. Icebreakers are always a good way to get kids talking to each other. Don't get me wrong - cool videos help, crazy skits help and fun games help. This doesn't mean you drop those things. You simply make them support for the main thing - building relationships. Use these and other tools to help kids get connected and establish friendships. And of course, as a volunteer leader, you can be a friend to kids. When kids know you genuinely care for them and are there to be a friend on their spiritual journey, they'll be waking up their parents to be on time for church. #5 - Let each child hear their name spoken. Every child should hear their name spoke each time they are at church. This lets them know they are valued as a person. And with name tags, it's easy to address each child by name. Just be intentional about it so you don't miss anyone. It's also a game-changer for kids when they hear their name called out in prayer. During your prayer time at church, pray for each child by name. Taking prayer requests from each child and then praying for their requests is important as well. Incorporate the 5 steps in this verse and you will leave a legacy of faith in the lives of the kids you minister to.